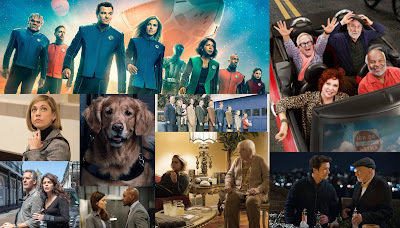 -Fresh Off The Boat upgraded from "Likely to be Canceled" to "Watching"
-The Muppets downgraded from "Watching" to "Likely to be Canceled"
-American Crime downgraded from "Likely to be Renewed" to "Watching"
ABC is really, really trying to save The Muppets, or at the very least, minimize their losses on the show. They just upgraded its time slot so that it has a lead-in, slightly retooled the show, and in my experience continues to automatically play on ABC website after I watch any ABC comedy. Who would have thought this would have happened when the show was first announced? Not me, as I predicted it would become the next Modern Family or Office. Now, it's likely to be canceled. Why? Well for starters, it hit a series low in its return. I had originally thought that ABC would renew this show as a bridge for Once Upon a Time, the time slot Galavant has taken for two seasons in a row now. I still hold to my opinion that if renewed, that's really the only plausible option for The Muppets. Now, over its first season, Galavant had a 2.0/1.3/0.9/1.1 trend in the ratings, and I just can't see how it comes back after its numbers this season. If The Muppets can stabilize around a 1.0, I may just have to call a renewal come May. 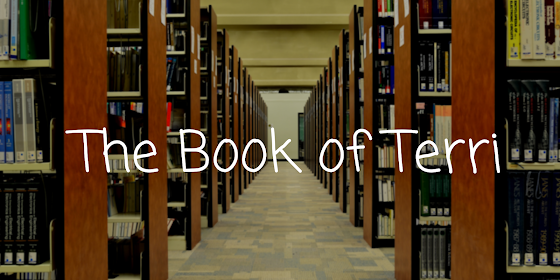 If not, I'll have to brainstorm some other options for a Once Upon a Time bridge, and I invite everyone reading this to do so as well. So The Muppets is a likely cancellation for now. It would be a much easier call if it weren't for corporate synergy. 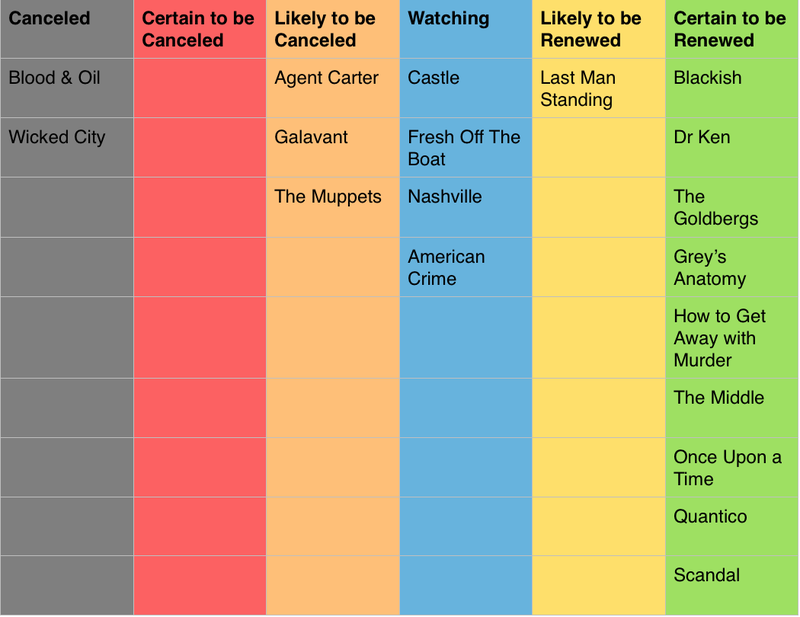 Now, if you've been following ABC Renew/Cancel Watch on The TV Ratings Guide, you've probably heard me explain why I had thought Fresh Off The Boat would be a likely cancelation. Such reasons included ABC doesn't own it, it's far from syndication, it's ratings have been declining, it may not even be as strong as the Friday shows, etc. But seeing it actually rise to a 1.4 A18-49 rating last Tuesday was actually a bit of a surprise to me. Could The Muppets actually have been hurting the show? I think Fresh Off The Boat could go either way now. It may be packaged with Last Man Standing again, for example. advertising this or nor, but what some others see as an outlier episode for scheduling reasons, I see as a tryout. 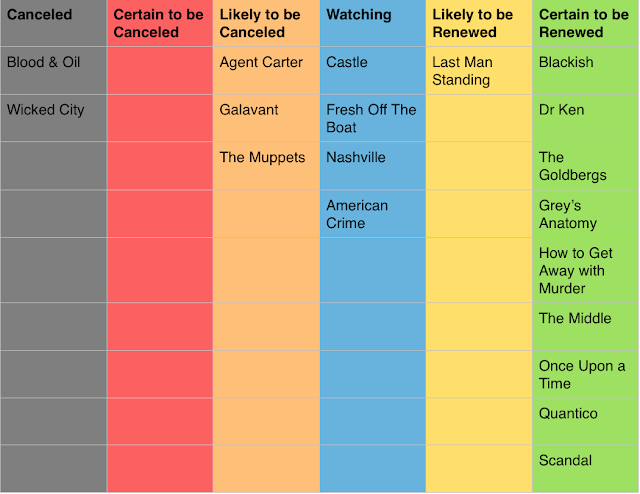 ABC wasn't exactly known to have released a radical schedule this year, but I can now see a scenario where Quantico moves to Sunday at 9 or Monday at 10, with Castle taking on Sunday at 10. But that's ONLY if Castle does good enough on Sunday. And by good enough, I mean at least a 1.0. The Family is still an unknown, but if Castle does OK Sunday at 10, I can see it surviving. I can't, however, see both Castle and Nashville surviving, nor both being retired. So in my eyes, this is do or die time for Castle. No pressure. What do you think of my predictions? Please, leave a comment below with your own thoughts!